The Eviyos prototype developed by Osram Opto Semiconductors is the world’s first hybrid LED and represents major progress toward the first market-ready smart controllable high-resolution LED. As soon as oncoming traffic is detected the appropriate pixels are automatically switched off so drivers of oncoming vehicles are not dazzled. The prototype, integrated in a demonstrator from Osram Specialty Lighting, will be on show for the first time at ISAL from September 25 through 27, 2017 in Darmstadt. Eviyos has its basis in the µAFS research project which was completed in the fall of 2016. The project involved various partners from the industrial sector and was coordinated by Osram Opto Semiconductors. The prototype combines two technologies in one component: a light emitting chip and individual pixel control electronics. This combination means that the 1,024 pixels of Eviyos plus the driver are all accommodated in a footprint of approx. 4 mm x 4 mm. The light source has minimum luminous flux per pixel of 3 lm at 11 mA. Initial prototypes have already exhibited more than 4.6 lm per pixel. Customers can vary the number of hybrid LEDs in their applications and supplement them with conventional LEDs, depending on the particular requirements that need to be met. “The hybrid LED is another example of our products making a major contribution to improving the quality of life in many different areas. With Eviyos we are helping to make the roads safer and improve comfort and convenience for drivers. We are proud that we can present the first prototype so soon after completing the research project. We are now another stage further toward series production”, said Thomas Christl, Marketing Manager at Osram Opto Semiconductors. Eviyos is not only compact and powerful but also energy-efficient thanks to the precise control and dimmability of the individual pixels. The only pixels that are ever on are the ones that are actually needed at the time. At its planned launch at the start of 2020 Eviyos will form a separate product family offering a wide range of possible applications. 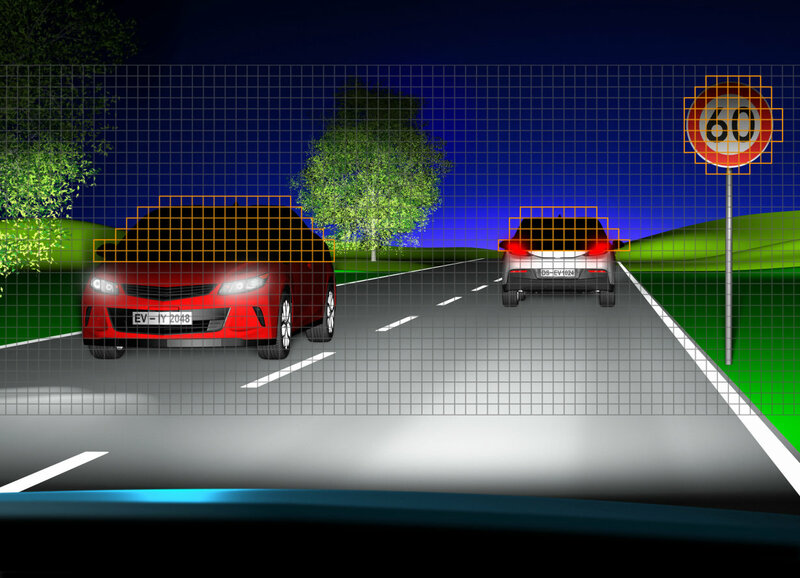 Smart headlights are just one of the potential areas in which intelligent selective pixel control can be applied.